By operating a fully equipped art department, we can eliminate all the hassles associated with creating your own ad. If you choose to submit your own camera-ready logos, we will assure you of nothing less than the best. 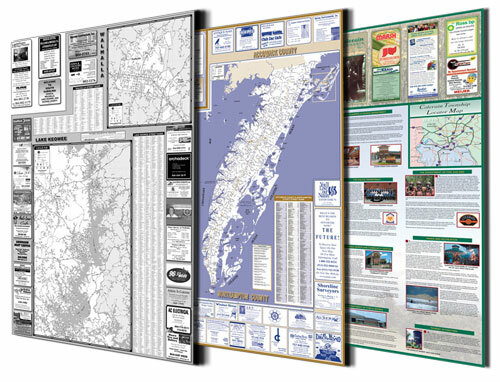 Map advertising has proven itself to be cost effective and widely distributed. Our prices range from as little as one hundred up to several hundred dollars for each display ad (typically cover exclusives). Each advertiser receives: Free ad layout, a personal supply of maps, free professional counter display box, and much, much more. In addition, NO ONE pays for their ad until the maps have been delivered. These are our digital map styles. Black and White, 2-Color Gold and Blue, and Full Color.